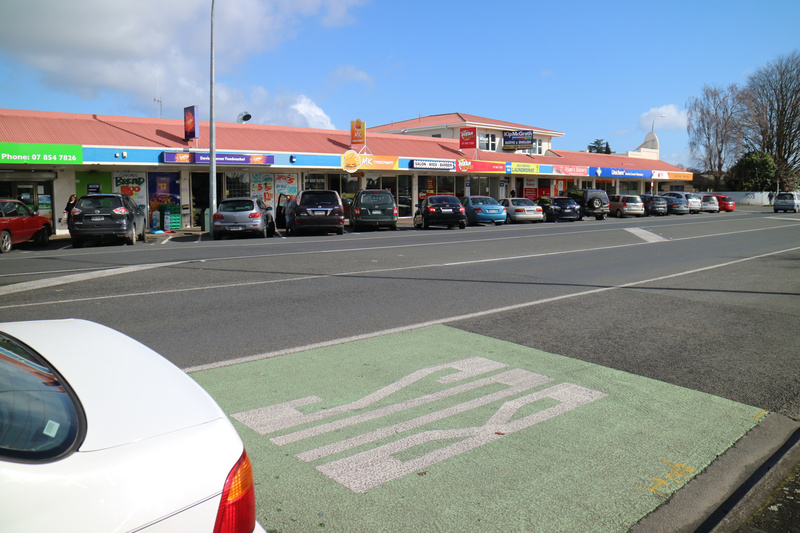 Hukanui-Peachgrove Road is a popular route to many schools and workplaces, but has congestion, high crash rates and dangerous spots for cycling. Potential to increase active transport (and reduce congestion) is good. So HCC has embarked on a $20m “School Link” project to provide “a safe cycleway for almost 9,500 students who go to school within the Hukanui/Peachgrove corridor”. One of the ‘pinch points’ for cyclists and pedestrians on this route is Davies Corner. 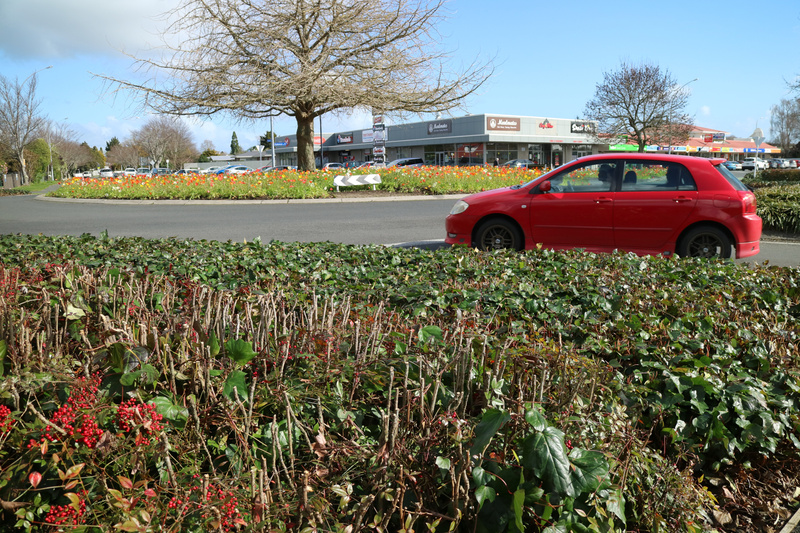 This is a busy suburban-strip-type shopping centre and roundabout at the intersection of Peachgrove, Hukanui and Clarkin Roads and Snell Drive. Making dedicated cycle paths on the eastern side of Hukanui Road (opposite the shops) could be relatively easy, as the footpath is extra wide and could be widened a little and marked for cyclists’ use. The bus lane could be removed, its value seems to be in making sure cars don’t create another lane, since it is so short that the time merging in and out of it may make up for any time saved by passing cars. On the western (shops) side, parking could be changed to parallel parks which may slightly increase visibility and space for a cycle path, but business owners don’t want to reduce parking spaces. If the footpath was wCycle Pathsidened to include a separated cyclepath, both pedestrians and cyclists could travel in front of parked cars, whether angle or parallel-parked. Overpass – My if-there-were-no-fiscal-or-physical-limits ultimate dream solution. Perhaps all the funding should be spent on over or under-passes here and at Five Cross Roads. There is possibly enough length to get the height needed on the footpath along Snell Dr/Hukanui corner, maybe not quite enough on the other streets. Underpass – These are awesome, the ones on Wairere Drive enable a raft of people to use active transport who would otherwise use a car. 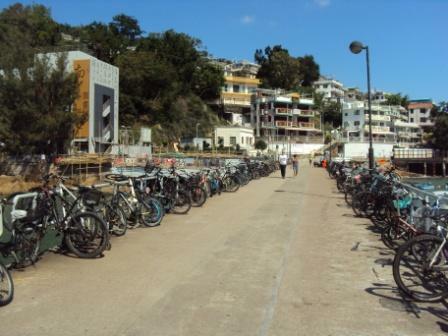 An example of retrofitting one is on Cobham Drive. Could be a tricky getting enough length for it to be a gradual slope. People may congregate under there, I’m not aware of this being a major issue in other spots, although graffiti is a constantly returning resident! Continue the cycle paths around the roundabout, well-marked, with contours which force drivers to reduce speed, and good signage. But these designs require cyclists and pedestrians to cross the path of the vehicles, which still seems rather scary to me, unless the motorists have been slowed down already and are willing to give way to a cyclist. The current recommendation to wait and cycle in the centre of the same lane as cars mean vehicles are usually behind you and can’t pass directly in front of you. Kensington Place – Removing the final carparking space on Hukanui Road, or making it motorbike- or pushbike-only would improve visibility. “No u-turn” signs on Hukanui Road could reduce dangerours u-turns, but may increase u-turns on Kensington Ave.
HCC is currently in consultation mode for the whole Hukanui-Peachgrove Rd school link project, with recent workshops attracting a range of views. So if you have an opinion on how to improve these routes, even if it is just agreeing with this post, let them know; email bike.hamilton@hcc.govt.nz Community open days and tactical urbanism to trial ideas are planned for Feb/March 2019, presenting a narrowed list of options for input. If you are interested in ideas for improving other pinch points along this route, check out my previous posts on Stephanie Says (Hamilton, NZ) on Facebook. 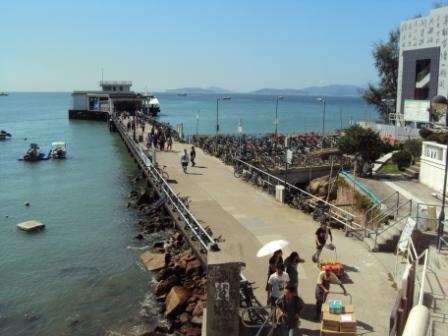 The Government’s solution was to build a very expensive bike park next to the pier, which was complete when I visited again in June 2015, but was not being used foe pibe parking, for unexplained reasons. But was being used as play area for children. 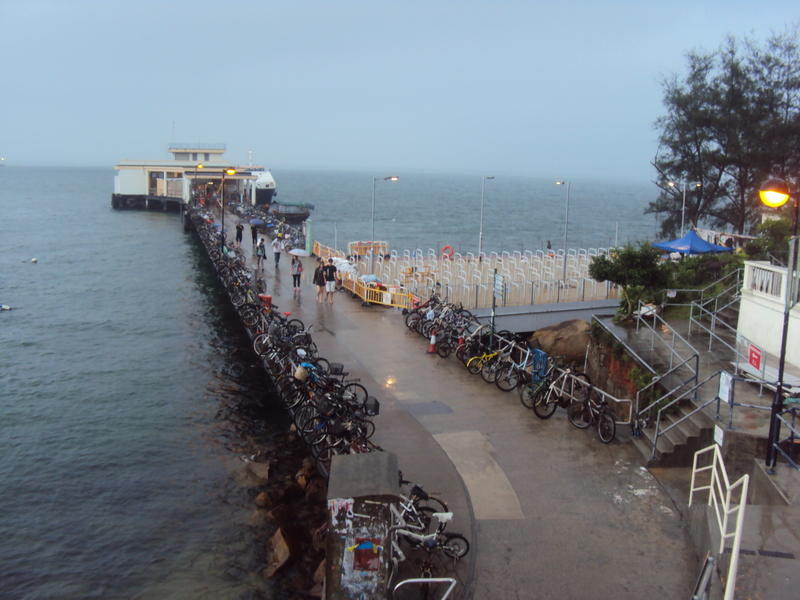 I visited again in Nov 2018 (second photo above); now the bike park is overflowing, and bikes are again taking the space along the pier railing. 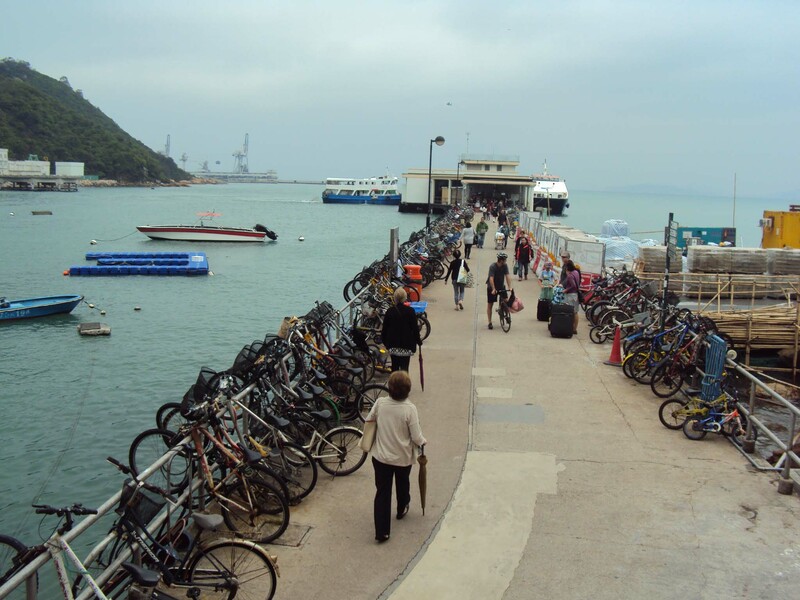 The above photo shows it’s not back to the same level as in 2015, but coming out of the ferry terminal I do get the feeling the extra bike parking has encouraged more people to bike, as my most recent photo from Nov 2018 below shows.